Tessa Nunn is a PhD candidate in Romance Studies at Duke University, where she likewise is completing a certificate in feminist studies. Her dissertation, “Writing Women Dance,” examines representations of women dancing in nineteenth-century texts written by women. Additionally, she has written on works by Simone de Beauvoir, Luce Irigaray, Ousmane Sembène, Jean-Luc Godard, Agnès Varda, and Georges Rodenbach. 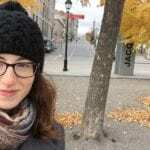 Having taught in French and American high schools, middle schools and universities, she is passionate about feminist practices in pedagogy and curriculum-building. Tessa Nunn discusses the topical Heroines by Kate Zambreno as a poetic memoir and a pertinent critique of sexism in academia and mental health care.